What I like on a Sunday is to have something cooking gently in the oven and smelling wonderful while I get on with other things. This dish is perfect. It needs very little attention and it tastes incredible. Preheat the oven to its highest setting. Take the shoulder of lamb and cut deep slits at regular intervals all over the skin and any exposed flesh. Stuff the thin slivers of garlic and rosemary spikes into the cuts. Rub the lamb all over with a tablespoon of olive oil, then season it well with salt and pepper. Place the lamb in a large roasting tin and cover it with foil. Put it in the oven and immediately turn the temperature down to 170°C/Fan 150°C/Gas 3–4. Leave the lamb to cook for up to 4 hours, checking after 3 hours – it will be done when the meat is falling off the bone and can easily be pulled apart. Put the lamb on a warmed serving platter and leave it to rest. Drain off any liquid from the roasting tin into a jug and wait for it to settle, then skim off any fat. Transfer the skimmed juices to a small saucepan and heat them through. Heat a tablespoon of olive oil in a large saucepan. Add the onion and cook it gently until soft and translucent. Add the beans, stock and tomatoes and season with salt and pepper. Bring to the boil, then turn down the heat and leave to simmer until the tomatoes have broken down and the beans are piping hot. 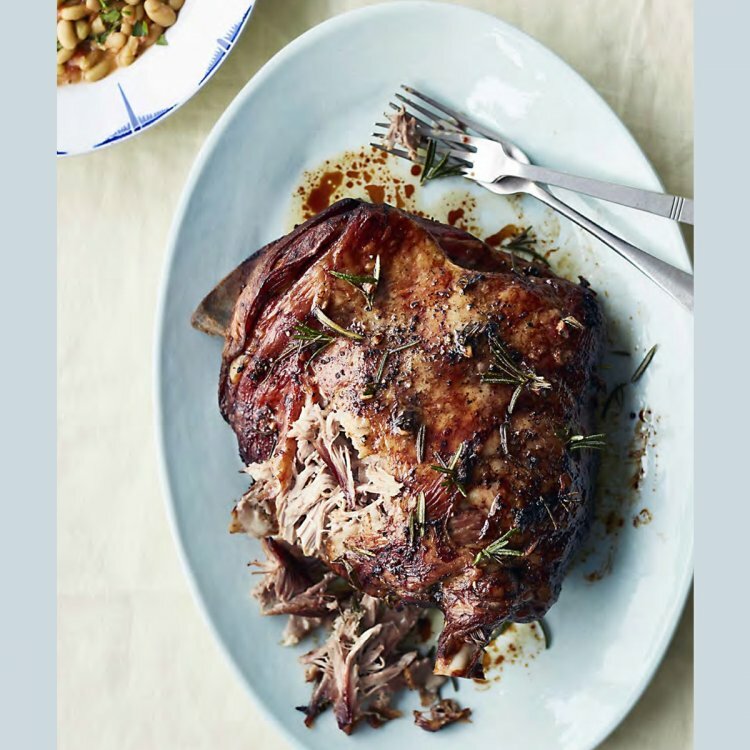 Serve the lamb with the strained pan juices and the beans, garnished with parsley.